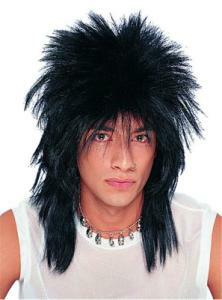 Features a unisex Rock Star wig*, one size fits most adults. Great for any metal head or rocker costume! Wig may require some additional styling to achieve desired look. WARNING: May be flammable. Keep away from fire. Do not use styling tools with heating elements, this will damage synthetic fiber. Cool styling tools, plastic curlers and hair spray recommended. *Jewellery, Costume and Accessories Not Included.